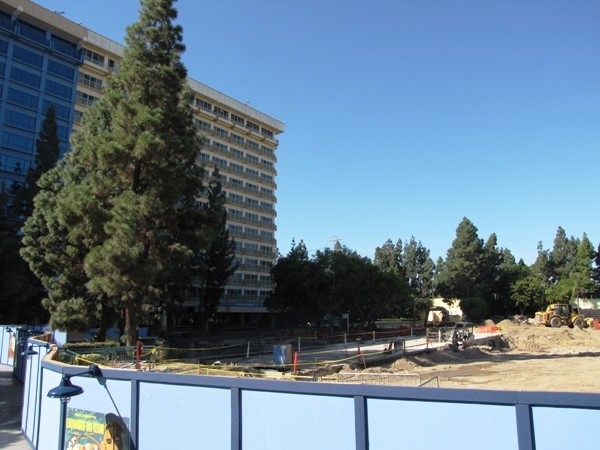 The Disneyland Hotel is not only updating the hotel rooms, but is also completely revitalizing the entertainment facilities around the hotel resort. The entire area between the Hotel Towers is under construction and the result will be a whole new pool and entertainment area. The refurbishment is continuing. 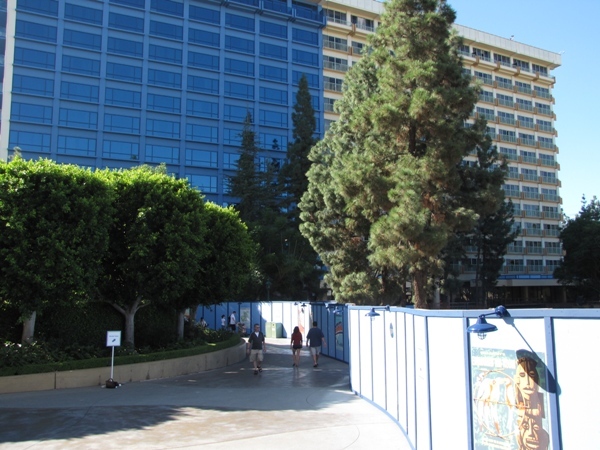 Let’s take a look at the changes around the Disneyland Hotel property. 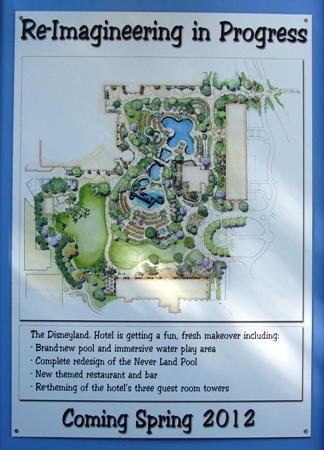 The Disneyland Hotel has always had more than just hotel rooms. In the early days, the Hotel featured a swimming pool, many shops, a cocktail lounge and several restaurants. 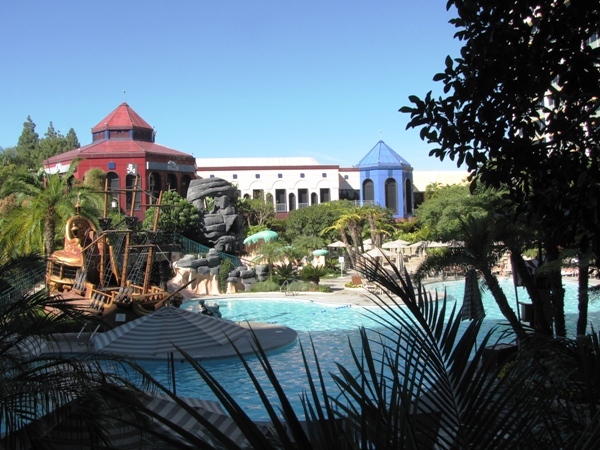 Later a golf center (including a rather distinctive miniature golf course), a banquet hall and a full convention center were added to the Hotel complex. 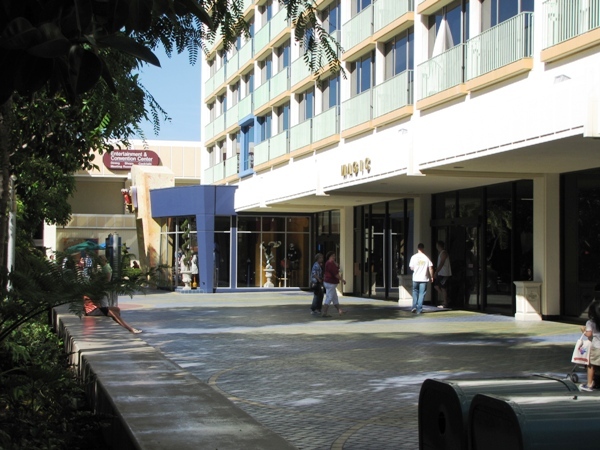 When the second Tower was added, an additional shopping area was also created. 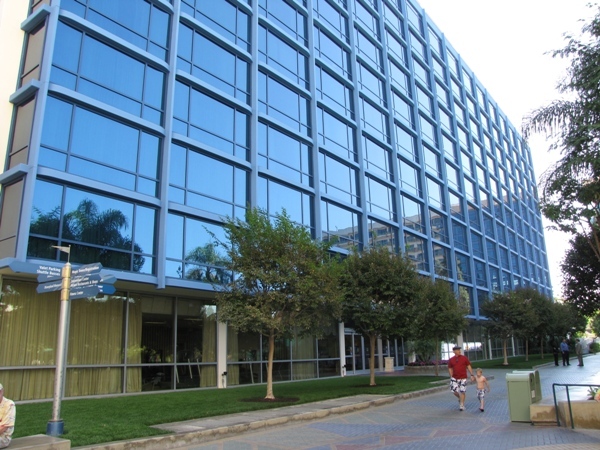 This further expanded when the marina area was built between the two Hotel Towers. 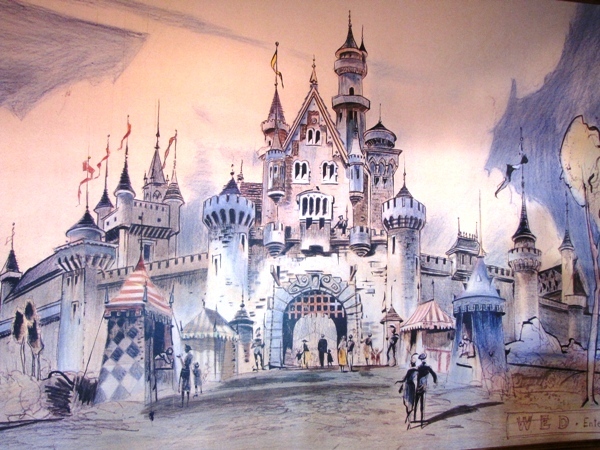 Image: Castle mural in the Disneyland Hotel lobby. 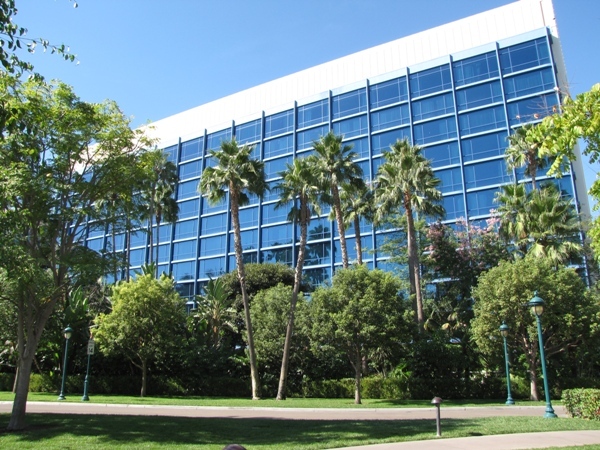 As the years progressed the Disneyland Hotel resort also grew and added more and more facilities. The Coffee Shop, Monorail Cafe and Monorail Bar were favorite stops. By the late 70s, the Hotel featured Restaurant Row which included a “Yukon” style lounge (where I remember Karaoke first being introduced). There were also many little boutique and Disney souvenir shops. 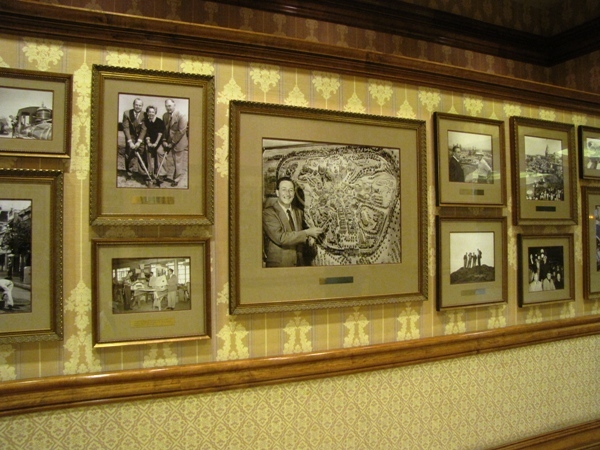 Image: Original Disneyland photographs, displayed in the Disneyland Hotel. 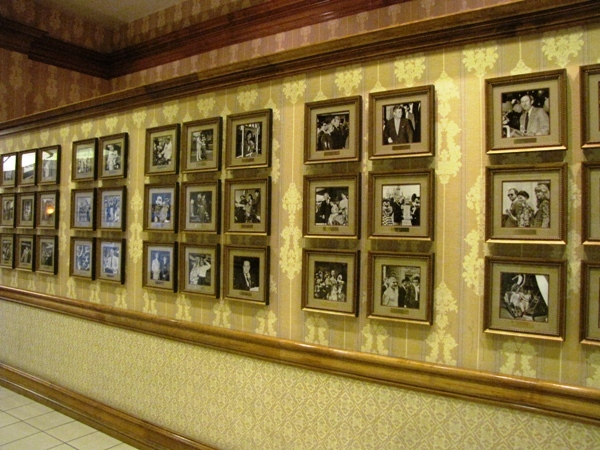 Image: Famous Disneyland Hotel guests. 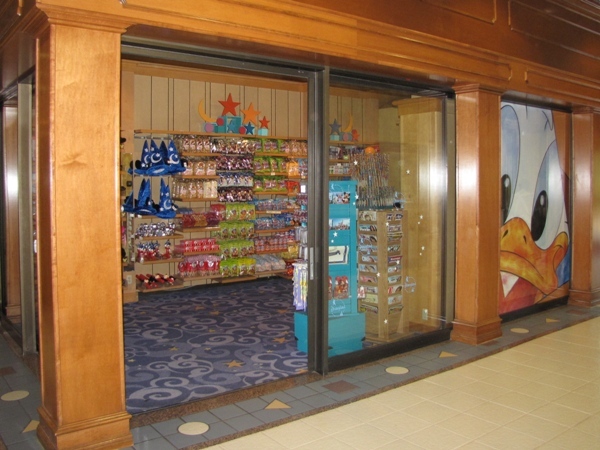 The “sundries” shop between the Towers was a great place to pick up a quick soda or snack and also had some souvenirs. I remember going in there in the early 80s and noticing a little metal bucket next to the checkout stand. Inside were all these tubes and each tube contained a rolled up plastic drawing of a Disney character. I asked the cashier what these were and she explained that they were called “cels” and they were “leftovers” from when the Disney cartoons were produced. Even though they were only $1 each (yes, that is correct), I didn’t see much use for them and passed it by. Wow! 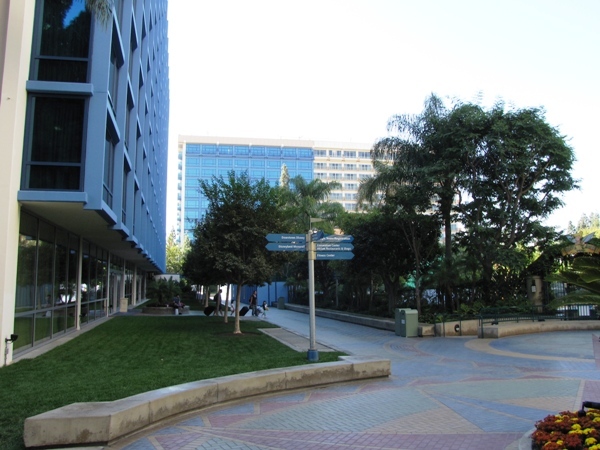 The marina area too has undergone changes over the years, including the creation of Water Wonderland. You could rent a paddle boat in the marina, drive radio controlled boats and cars and visit many other specialty shops around the marina. There was a full Dancing Waters show in the back corner (which also had a great Christmas show) and each night the marina would light up with a tropical feel. One of the best parts was the waterfall area which featured Horseshoe Falls where you could walk behind the falls. Image: Horseshoe Falls in the Water Wonderland area. For a time, the Water Wonderland area featured a “laser sculpture” at night. Green lasers were projected from the Towers and crisscrossed over the marina, bouncing from one point to another. As you walked from one part of the marina to another, different parts of the laser patterns would appear. It was huge and very impressive for its day. 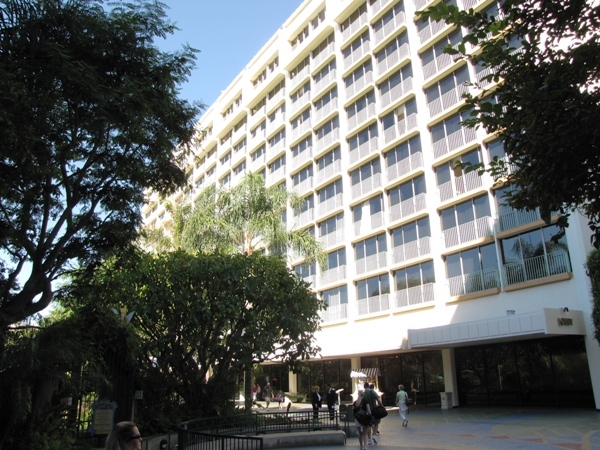 Back in those days, it was easy to spend an entire evening at the Disneyland Hotel, even if you were not a guest. 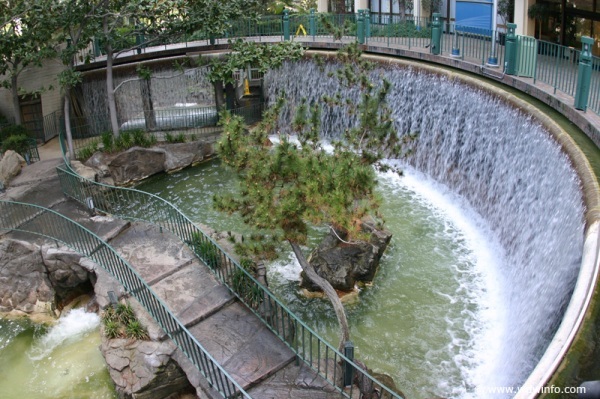 I remember coming down for the weekend and the first night you would always come to the Hotel, have dinner and play around the marina, go see the Dancing Waters show and walk past all the waterfalls and paths. It was great. 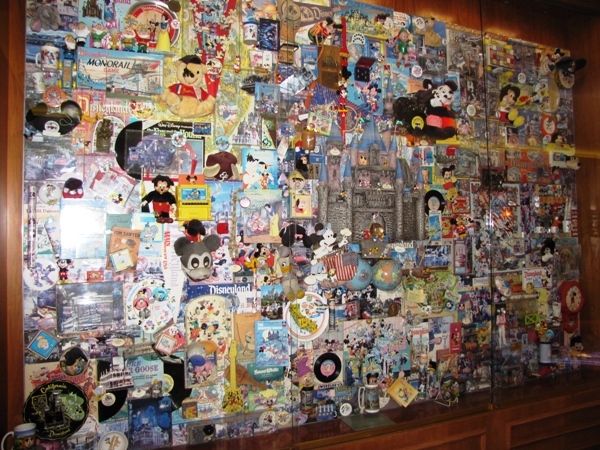 Image: Memorabilia display near the Convention Center. How many did you have? Now the entire entertainment area is being recreated. 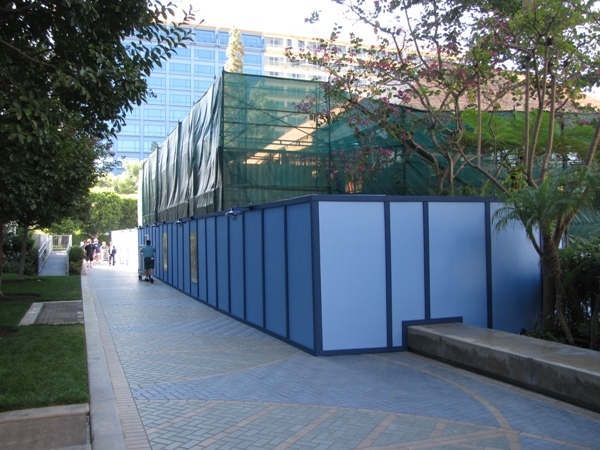 Water Wonderland is now entirely gone and virtually everything inside the marina is being replaced. 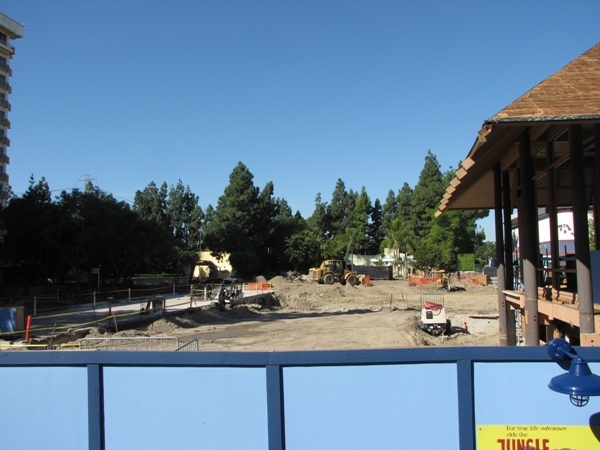 Disney has projected that some of the changes will be completed by the summer of 2011 with the complete renovation to be done by summer 2012. 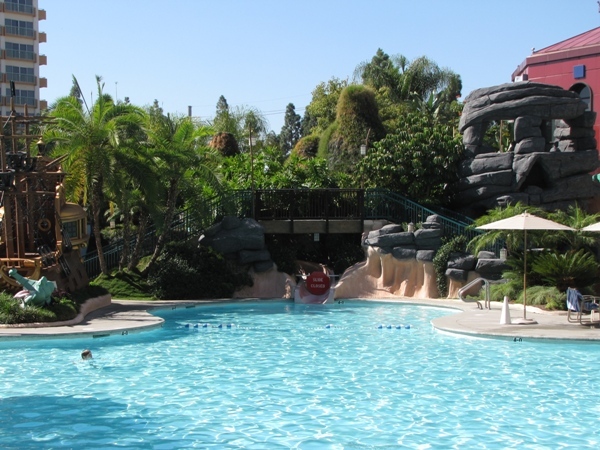 The changes include a completely redesigned pool area featuring two monorail themed water slides. There will be a new Polynesian style restaurant and lounge which Disney says will be themed similar to “the original Tahitian Terrace restaurant in Disneyland Park”. 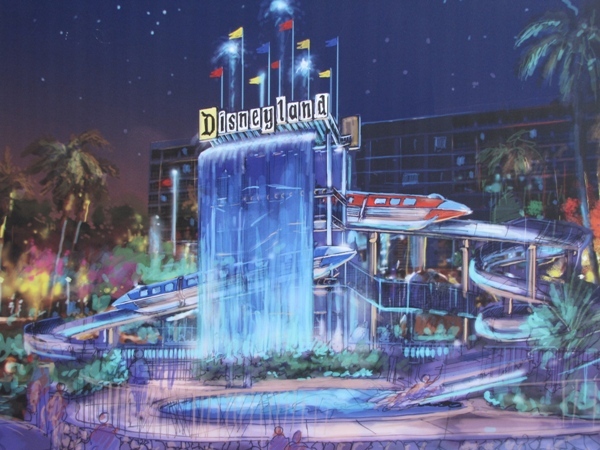 Image: Artist concept of the new Monorail waterslide. 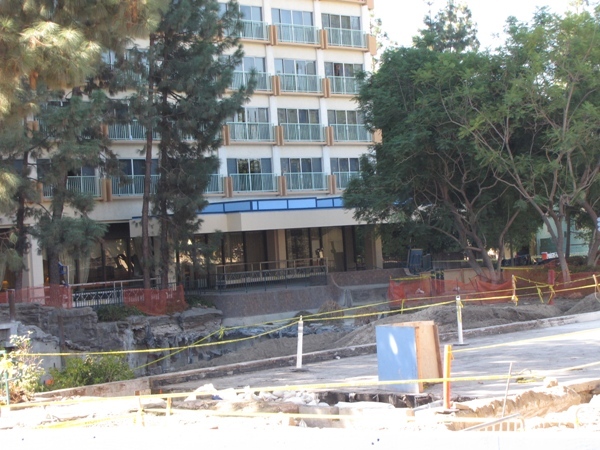 Here are some pictures of the construction (or should I say destruction) around the old marina and hotel area. There were all taken in October 2010, just after the area closed for the refurbishment. Below is the current Magic Tower. This will be the last Hotel Tower to get the new style hotel rooms. Note the small balconies for each room. Here is a closer view of the Magic tower. Note the one refurbished room on the end of the second floor. In this view you can see how the balcony was reclaimed for a little additional room space. Across from the Magic Tower are the newly refurbished Dreams Tower (to the left) and the Wonder Tower (in the distance) which is currently under construction. The pool and old marina are to the right. Here is a close up of the refurbished Dreams Tower. The Dreams Tower as viewed from Downtown Disney. 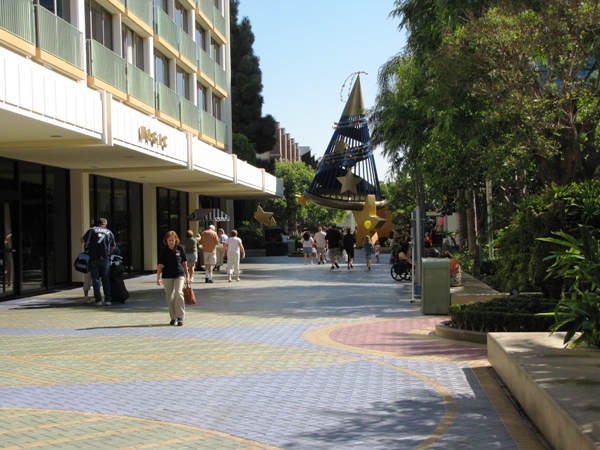 Below is only path from the main lobby in the Magic Tower back to the Wonder Tower. The old Hook’s Pointe and Lost Bar (home to several DIS meets) was just behind the construction wall. Further down the path lead to the Water Wonderland area and the Wonder Tower. Below is what’s left of the wonderful Water Wonderland area. Change is inevitable and new things are exciting, but watching the turnover is sometimes a little hard to take when you see bulldozers actually tearing down the areas you once walked. Below is where the Horseshoe Falls were. The Lost Bar is completely gone and the structure to the left is Hook’s Pointe. 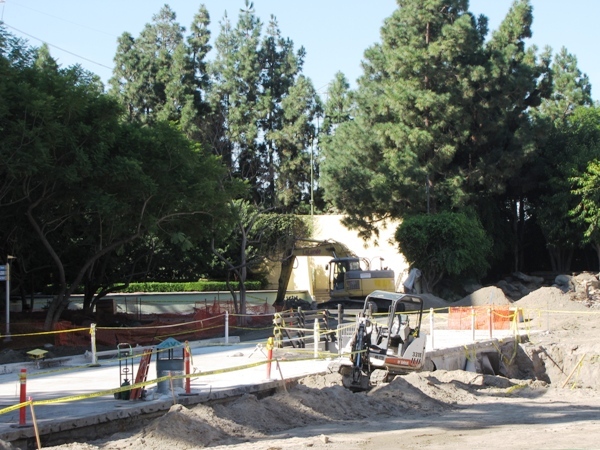 In the far corner was the old Dancing Waters area. 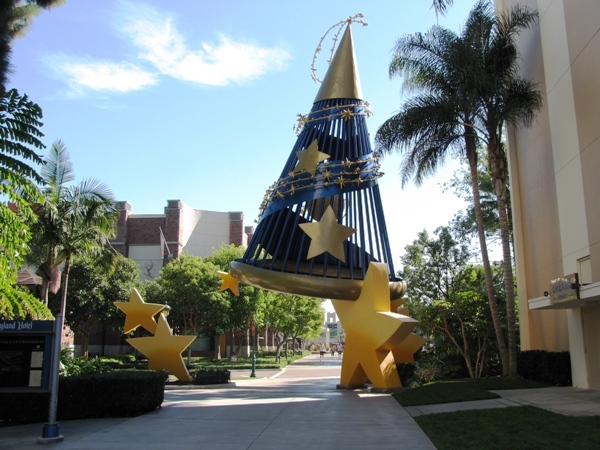 The show itself is long gone and was replaced by a simple planter where the fountain pool was. This area will also be reclaimed. 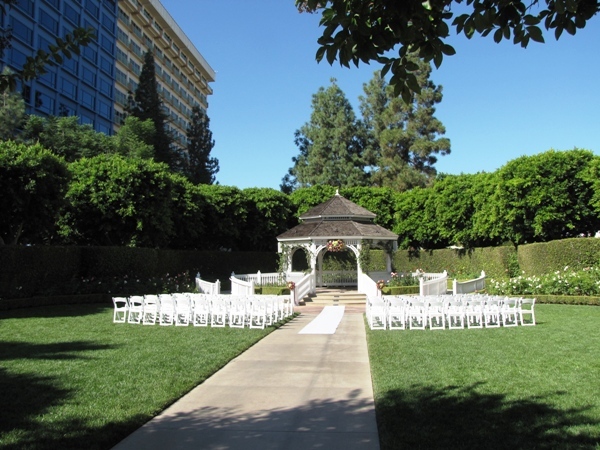 The current Wedding Garden remains to the east of the marina area. This was where the old Restaurant Row was. It seems relatively peaceful amidst all the construction. As with all refurbishments, the time between the start of construction and when the new elements start coming together is a mix of emotions. You hate to see your favorite locations changed, but the hope is that the future will bring a whole new set of experiences to explore. For now, we have our memories. I hope I can soon bring you the pictures of the exciting refurbished Disneyland Hotel and we can all look forward to new magic.